Veteran actor Tom Bell, whose many film and TV roles included a Bafta-nominated performance in drama series Prime Suspect, has died aged 73. He died in hospital following a short illness, the actor's agent said. Bell appeared opposite Dame Helen Mirren in the first three series of Prime Suspect, and returns in the seventh being shown on ITV1 next month. 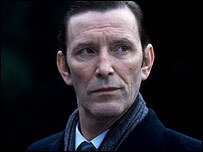 He earned a 1979 Bafta TV nomination for Out, and played Jack "The Hat" McVitie in the 1990 film The Krays. Bell played Detective Sergeant Bill Otley in Prime Suspect, a sexist officer who clashed with Dame Helen's character Jane Tennison. He also appeared in films including Wish You Were Here, Prospero's Books and Swing. An ITV1 spokeswoman said: "We are greatly saddened by the news of Tom's death and extend our deepest sympathies to his family." Bell is survived by a son and two daughters.